There are many ways to do fine work. One approach is to start by choosing to have a positive attitude. 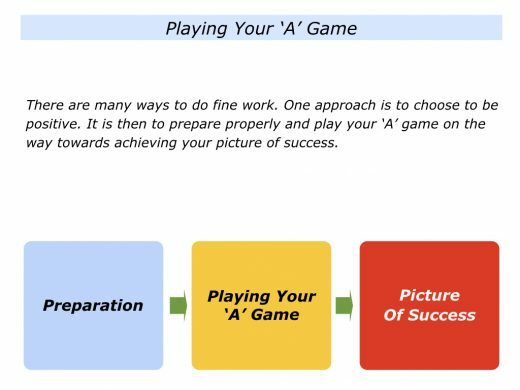 It is then to prepare properly and play your ‘A’ game on the way towards achieving your picture of success. Different people apply this approach in different situations. You may choose to do this when doing the following things. You may go into the role of being a carer, educator, leader, mediator, host, trusted advisor, scientist or another role. You may be doing a task, playing a sport, performing on stage, building a house, designing a piece of software or doing another project. You may be tackling a challenge, finding solutions to a problem, performing a surgical operation or working in another pressure situation. Looking back, can you recall a situation when you aimed to play your ‘A’ game rather than your ‘B’ game or ‘C’ game? You may have been doing a pleasurable task, doing a project or working in a pressure situation. What did you do then to have a positive attitude, prepare properly and do your best? What were the principles you followed? What happened as a result of taking these steps? 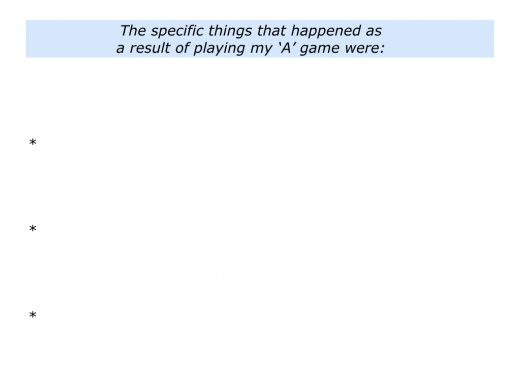 Describe a specific situation in the past when you played your ‘A’ game. 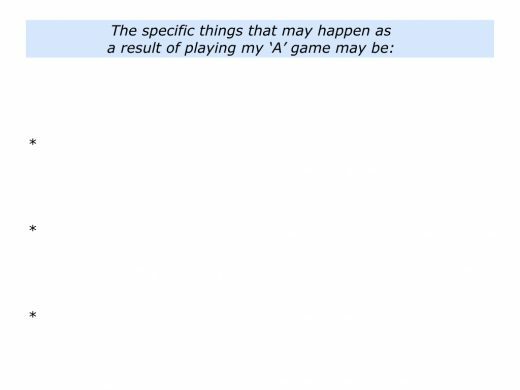 Describe the specific things you did to play your ‘A’ game. Different people play their ‘A’ game in different ways. One common factor, however, is that they are often positive realists. They have a positive attitude but are also good at reading reality. Bearing in mind the situation they are facing, this involves asking the following questions. What is actually happening? What are my options in this situation? Do I want to tackle this challenge? If so, what are the real results I want to achieve? Bearing in mind what I can control, on a scale 0-10 what are the chances of success? What can I do to improve the rating? How can I do my best to achieve the picture of success? Assuming a person wants to tackle the challenge, they then focus on the following steps. Great workers prepare properly and set things up to succeed. They take this step whether they aim to climb a mountain, lead a team or do a particular project. Bearing in mind what they can control in the situation, they do the following things. They clarify the real results to achieve – the picture of success. 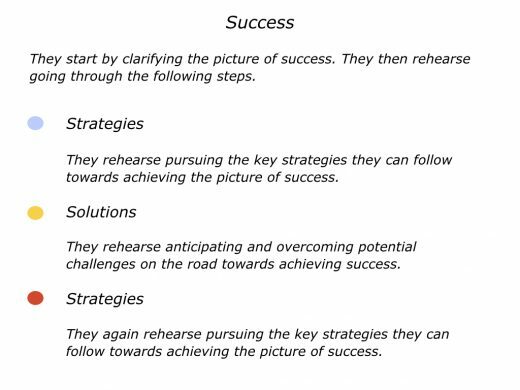 They clarify the key strategies they can follow to give themselves the greatest chance of success. They clarify the challenges they will face and how to manage these challenges successfully. Arie de Geus, author of The Living Company, spent many years helping companies to do scenario planning. He found that peak performers develop what he called a memory of the future. They constantly envisage what might happen in their chosen field. They also develop a repertoire of tools for dealing with such challenges. This means they are several steps ahead when these situations become a reality. Such workers rehearse everything before tackling a challenge. Sometimes they do the physical rehearsal, sometimes they do mental rehearsal. Here are some of the steps they take to prepare properly. Different people have different versions of what it means to play their ‘A’ game. Some sports coaches, for example, encourage their players to focus on being the best they can be. John Wooden, the American College basketball coach, took this approach and encouraged his players to develop as human beings. He never mentioned winning but his teams won more titles than any other in College basketball history. The base of the pyramid consisted of phrases such as: Industriousness; Friendship: Loyalty; Cooperation; Enthusiasm. Behind each of these words was an explanation. Be true to yourself … There is a no substitute for hard work and careful planning … Help others … Make friendship a fine art … Make each day your masterpiece. The approach worked. His teams left a legacy of winning titles, even though he did not talk about winning. You can learn about John’s life and philosophy at the official web site. Different people apply this approach in different ways. One framework they use is to focus on the following themes. 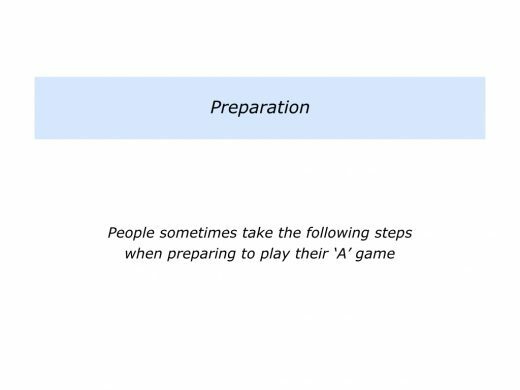 The person prepares properly and rehearses how to play their ‘A’ game in the situation. Clicking into action, they then follow their chosen principles and aim to do their best. Sometimes they may be blown off-course. If so, they buy time to relax, refocus and rehearse what they will do next. They then keep following their chosen strategy and work towards achieving their goals. Great workers often start by clarifying their long-term aims. They then translate these into short-term and medium-term aims that will take them towards their overall picture of success. A sprinter may aim to win an Olympic Gold Medal, for example, but recognise that this could influenced by factors beyond their control. They could suffer injuries, compete against better athletes or experience unexpected setbacks. Bearing this in mind, they will focus on what they can control when setting goals. They may focus on the following aims. To prepare properly both physically and psychologically. To be fully present, follow my chosen principles and perform at my best on the day. To look back in the future and say that I did everything possible to work towards achieving the Olympic Gold. The sprinter will translate their aims into daily, weekly and monthly targets. They will then follow daily disciplines on the way towards achieving the long-term goal. They will keep doing the right things in the right way every day. If blown off-course, they will reflect, refocus and say something like the following. Let’s return to your own life and work. Looking ahead, can you think of a situation in the future when you may want to play your ‘A’ game? This could be in your personal or professional life. You may want to do this when encouraging a person, doing a project, leading a team or doing another activity. You may want to do so when acting as a parent, teacher, counsellor, performer or in another role. What can you do to be positive in the situation? How can you prepare properly? How can you then do your best? How can you work towards achieving your picture of success? If you wish, try tackling the exercise on this theme. This invites you do to the following things. Describe a specific situation in the future when you may want to play your ‘A’ game. 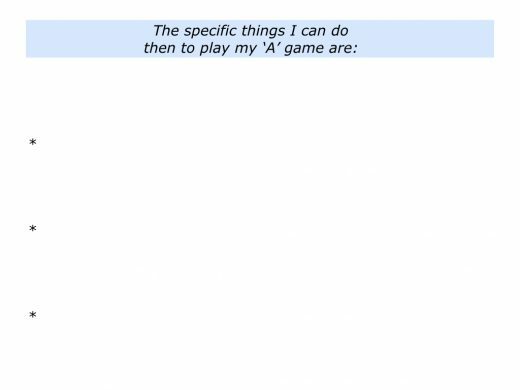 Describe the specific things you can do then to play your ‘A’ game.